Rocky's Boots was a commercial educational software product, published in 1982 by the Learning Company. It won Software of the Year awards from Learning magazine (1983), Parent's Choice magazine (1983), and Infoworld magazine (1982, runner-up), and received the Gold Award (for selling 100,000 copies) from the Software Publishers Association. It was one of the first educational software products for personal computers to successfully use an interactive graphical simulation as a learning environment. It was a precursor to later simulation products such as The Sims and Minecraft. 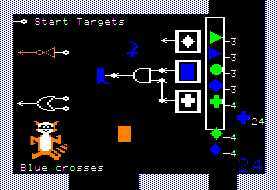 Rocky's Boots was a visual simulation that made it possible for upper-grade-school students to design simple digital logic circuits, using a joystick to move around circuit symbols on the screen and plug them together. The circuit components were AND gates, OR gates, NOT gates, and flip-flops. The colors orange and white were used to show the logic states "1" and "0" of the components, so that as the circuit operated, the signals could be seen propagating through the circuits, as if the electricity was liquid orange fire flowing through transparent pipes. Play Rocky's Boots on a PC using an Apple II Emulator. Rocky's Boots was originally designed for the Apple II computer, but can be run nowadays on a PC using an Apple II emulator (such as AppleWin) and a disk image of Rocky's Boots.